Because Switch is a spoof on legal dramas, the cast naturally needs Prosecutors, other than Oh Ha Ra (Han Ye Ri). Will they be the good guys...or the ones' that Sa Do Chan wants to catch and jail? Or maybe something in between? 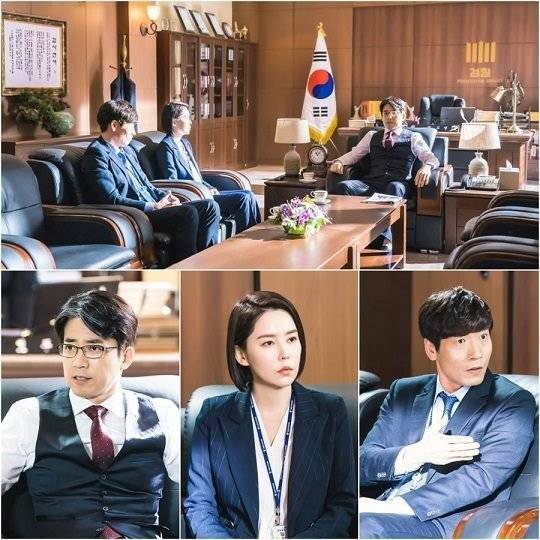 In the SBS drama "Switch - Change The World", Choi Jae-won, Park Won-sang, and Bae Min-hee take on the roles of Seoul Central District court prosecutors Jung Do-young, chief prosecutor Yang Ji-seung, and assistant prosecutor Jin Kyung-hee. Seoul District Court prosecutor Jung Do-young has a strong trust for his junior prosecutors, but also has a thirst for power. Yang Ji-seung is an introverted prosecutor who is barely adjusting to his career. Jin Kyung-hee is a charismatic female prosecutor. A scene of them having a conversation was released on the 18th. Jung do-young looks dignified as he's saying something serious with his forehead creased. Yang Ji-seung looks surprised as he's listening to Jung Do-young and is pointing at himself, reflecting his timid character. Jin Kyung-hee looks elegant in her short hair and she's not intimidated by the district prosecutor. "Switch - Change The World" begins on the 28th.